Campus construction has created temporary challenges for parking in Webster Groves, but a continued partnership with St. Louis Metro Transit could help relieve some of those issues for commuters. 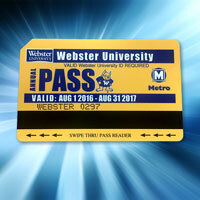 Webster University and St. Louis Metro Transit are partnering for the fifth year allowing students, faculty and staff to receive Metro UPasses at no cost. As part of the program, Metro offers an increased number of Metro bus trips between the Shrewsbury Metrolink station and the front of Webster Hall on Lockwood during hours that better match the needs of students, faculty, and staff. Parking is also available for Webster UPass users at the Shrewsbury Metrolink station parking lot. The UPass allows students, faculty and staff of Webster to ride Metro Bus and Metro Link transportation at no charge to them. New passes can be obtained in August at the Bursar's office. Passes from 2015 expire at the end of this summer. The collaboration between the University and Metro came about as a result of a Delegates' Agenda meeting, the avenue through which student leaders formally present to administration their ideas and priorities concerning improvements to their student experience. Visit the Bursar's office with your Webster ID, ensuring the proper sticker for the current semester is adhered to the back. Simply carry both your UPass and Webster ID as verification while riding the Metro bus and light rail system. For bus and train schedules, route planning and other information navigating the Metro system, visit metrostlouis.org or the Campus Life section of the University website. Metro UPass is just one of the environmentally friendly transportation options available on campus. Webster University has also partnered with Enterprise CarShare to provide a Toyota Prius Hybrid on campus for students to reserve online through the car sharing website. The availability of car sharing programs can lead to less driving and lower carbon emissions. Students at the Spring 2014 Delegates' Agenda requested the CarShare program.